There are many opportunities for members to help out in the club on a regular or irregular basis. The Committee: The club is overseen by a committee, made up of members who put their names forward at the AGM in November. The committee meets 5-6 times per year to discuss and decide on things such as the running programme, events, equipment needs, kit, finances, and the week-by-week running of the club. You don't have to be a fast runner to be a valuable committee member. Whatever your skills and enthusiasms, we can make good use of them. We always need more computer and web skills, more organisers, and lots of enthusiasm! For more detail about what the committee does, click here. If you would like to get involved and to be part of the committee, or to be an active helper, please let us know. The 2017 committee is Geoff Williams (Chairman); Bob Webb (Club President); Keith Hull (Membership); Robin Wakefield (Treasurer); Ross Maclagan (Secretary); Mike Brock (Coaching Co-ordinator); Dawn Salter (Ladies' Captain); Ian Coates (Men's Captain); Gareth Baker (Kit); Catriona Riddell (Social Events); Steve Moody (Media Editor, IT Admin), Lisa Norman, Veronica Scott. 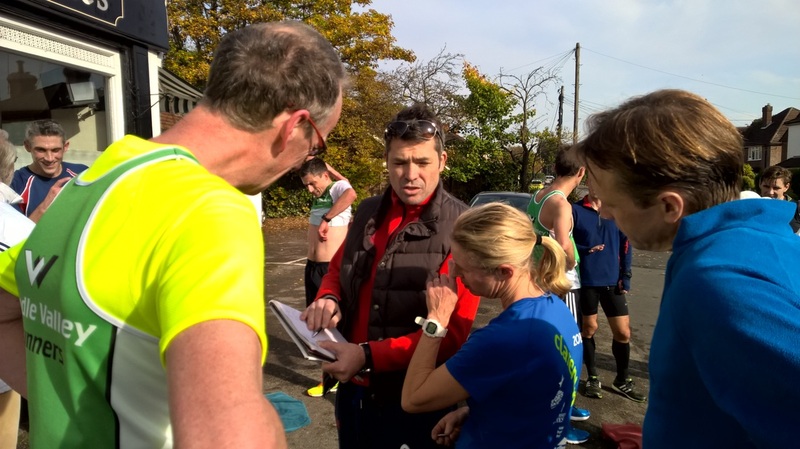 Events: we always need three or four helpers at our monthly 10K handicap run, and in winter, helpers and supporters at the cross-country races. In 2014 we started the Windlesham 10K Pairs Relay which we now hold each May, and we find that it needs about 20 helpers to go smoothly, plus lots of people to make cakes for afterwards. We will be appealing for volunteers during the month before the event..
Beginners' Groups: In Summer months we are often running "Couch to 5K" programmes for beginners. These need several people leading and assisting - they are great fun to be involved with, and the difference you make to people's lives is very rewarding. Run Leaders: The club's coaching and run leading is all done voluntarily by members. We have several members who have qualifications through England Athletics' Leadership in Running Fitness course, but we always are keen to have more! If you are interested in joining the coaching team, please speak to Steve or any member of the committee who can discuss what is involved and how you can gain the qualification.